Before we start, to create this yourself, you'll need a Ninox Cloud account (sending emails only works in the cloud). You can sign up for one here. Also, I have exported the database used in the article and it's available here - you just need to load it into your Ninox Cloud account. I am going to be basing this post on the database used in my previous post 'Relating to Relational Databases - Part 1' so you may want to check this out before we start. In this database, we start with two tables - Companies and Contacts - it is a very simple Contact Database. 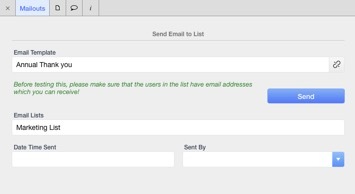 I want to create a facility for users of my database to be able to create mailing lists, add Contacts to them, and then send emails to them based upon a template which will allow for insertion of contact specific data as the messages are sent. In the process I also want to record each time a message is sent to the group, recording the template used, the date sent and the user who sent it. 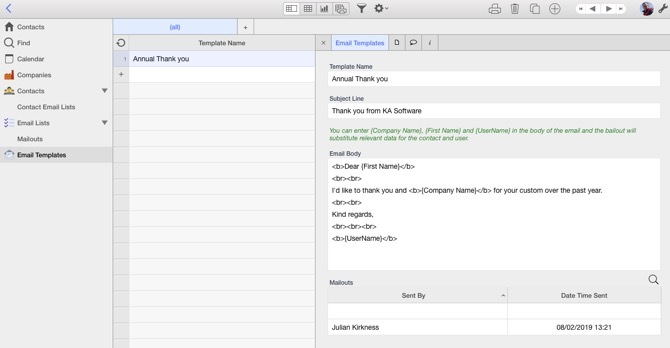 Email Templates - which is where the email Subject and Body are stored - the latter in HTML format. Email Lists - this is a record for each list we want to be able to send to. We will also need a little NX Code attached to a button to actually send the messages. 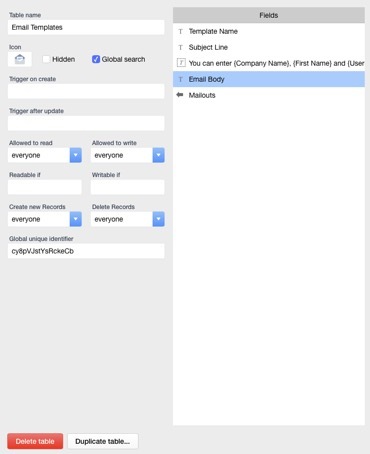 This table is where you can assign a Contact to one or more Email Lists and creates a Many to Many relationship between Contacts and Email Lists. The essential fields here are the two references - but I've added an Opt In field which allows you to indicate whether people are opted in to the emails or not (and the sending code will take this into account). 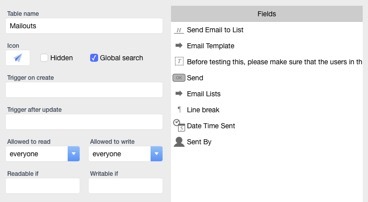 The replace function is used to replace the placeholders in the template with fields in the database - you can see that it would be simple to add additional options here or even extend the feature to allow placeholders in the Subject Line. Note the filter 'Opt In' = 1 - this will stop the system sending any messages to anyone who has opted out of this email list. Hopefully the functionality here is useful as a basis for building your own email facilities into your own databases. This could also be adapted to allow for sending messages to individual Contacts, saving the messages in a table linked to contacts or in many other ways. If you'd like to download the database used in this post then please do so here. Note that I have removed the email addresses from the contact records in the database - I suggest you add addresses which you can receive to some of them before trying it out! Comments and discussion always welcome! !